Stiff arms means lack of muscle flexibility and poor circulation. If you are a sportsperson, stiff arms can lead to poor arm strength, unhealthy muscles and poor flexibility. This is one of the leading causes of injuries and pain due to prolong hours of working. If you are keen in having a fit and healthy body, you need to focus on a few exercises which will reduce stiffness and immobility of a few muscles in the body. Stiff muscles can be tackled with a few targeted workouts. These exercises help in building flexibility and reduces chances of injuries. This is an easy workout and can be done by beginners as well. Start the workout as you stand with your feet a little distance apart. You need to have a dumbbell in your hands. You can also select a heavier weight to have in your both hands. You need to bend your elbows just behind the head. 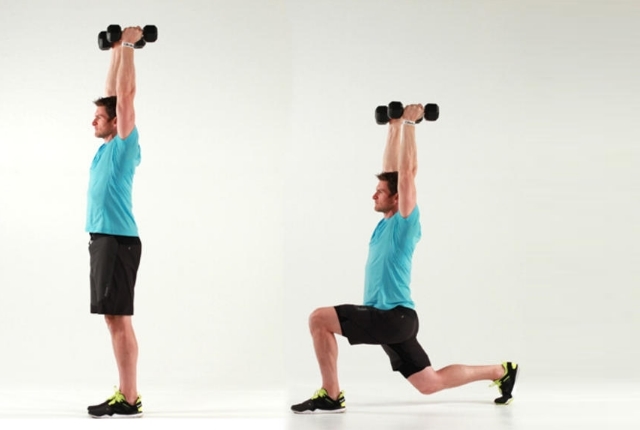 Now, slowly straighten the arms and move the dumbbell in the air. You can again slowly bend the arms and lower. This shall be counted as one repetition. You need to work on two sets and each should be of 12 or 12 repetitions. Stretching has always been helpful in reducing arm stiffness. It builds flexibility and improves circulation. You need to start the workout in a sitting or even a standing position. You shall be lifting one arm up and move it just above the head. You will again bend it, so that you are able to reach the back and move just behind the head. You will hold your opposite hand and again push a little back just against the elbow which is bent. Stay in this position for at least 30 seconds. You will soon get a good stretch in your triceps muscles which means you are doing the workout quite effectively. This is an interesting article and especially quite beneficial for women who are trying to lose weight from their body. Start the workout as you hold a dumbbell in your hand. You will raise the arms straight and move out towards the sides. Your hands and elbows shall be at your shoulder level. Your palm shall be facing up as you start the workout. Now, you need to slowly bend your arms upwards and move them to a 90 degree. Your arms shall be kept parallel to floor. Keep your elbows at the shoulder level. Your palms shall be facing in. You need to straighten the arms and get back to the start position. You will repeat the workout again at least 6-8 times to start with. As you get comfortable you can increase the count to improve the effectiveness of the workout. You need to start the workout in a standing or a sitting position. You need to cup the elbow using your opposite hand. Now, slowly lift your elbow and pull it nicely across the chest. You will not rotate your body when you are in this position. Stay in this position for at least 30 seconds. You will feel a good stretch and tension in the shoulders. You can again relax and then repeat the whole exercise using the other arm. You need to repeat this exercise at least 10 times for each arm. This is an exercise which is just perfect for those who believe that without dumbbells no exercise is complete. Stand in a comfortable position. Your feet shall be hip distance apart. Keep your knees a little bent. You will hold a dumbbell in your hand. 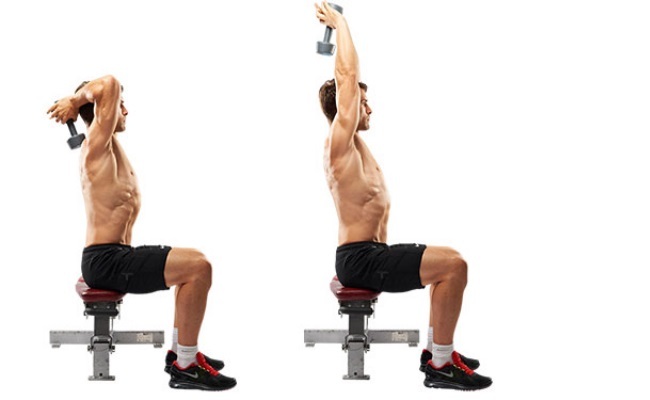 Now, slowly reach the arms overhead, as you hold on to the dumbbells in a vertical position. You need to have your arms close to the head. Your elbows shall be pointed to the ceiling. You need to straighten the arms upward. You can repeat the exercise at least 10 times. Push-Ups have always been a favorite for fitness freaks. You need to start in a good push-up position. Your arms shall be straight. Your knees will be on floor. Your feet shall be in air. Your hands shall be just under the shoulders. They shall be close in a push-up position. Now, you need to have your arms tightened. Keep your arms bent. Your chest shall move close to floor. Your arms shall be close to the sides. Keep your back straight. Your elbows need to be pointed behind and not outwards. You can straighten the arms and get back to start position. Repeat the exercise at least 10 times.